Last week, I introduced the class to French Surrealist poetry and Dadaism. This sounds very highbrow, but actually this poetry is right up the kids’ alley. Why? Because it’s totally nuts. Basically, these poets were responding to the insanity of World War One by deifying nonsense. But lots of it is very lively, wondrous nonsense. Hugo Ball as a performing obelisk, c/o wikimedia. 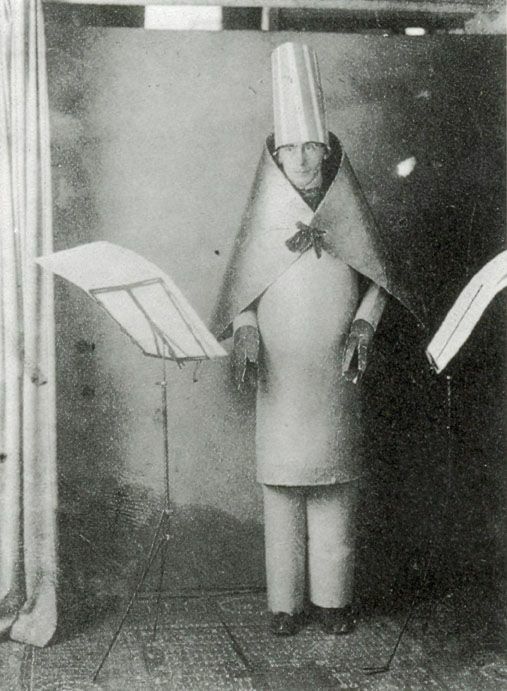 I told them about Hugo Ball and his “abstract poetry,” where he would get rolled onto stage dressed as a blue cardboard obelisk and recite things like “gadji beri bimba glandridi alula lonni cadori….” (Which is nonsense in French, too.) They loved it. I read them poems like “Dada Song” by Tristan Tzara, which has lines like “Eat chocolate. Wash your brain.” and “Hello” by Benjamin Peret*, with images like “my opal snail my air mosquito” and “my casket of sunlight my volcano fruit.” I talked about how one thing these poets wanted to do was bring together images that were very, very different than each other, like an opal and a snail, to make something that was crazy but that made you see something in a new way, like how snails and opals have a similar shimmer. I read them some in my terrible French and wrote some phrases in French on the board. Then I had the class turn upside down in their seats so they could see the world from a new perspective. I told them they could write while upside down if they wanted. I told them to write a crazy poem with crazy images, using nonsense words if they wanted and French words if they wanted. Lots of enthusiastic, giggly writing happened. But not all of the writing was empty silliness. There was also a real wild sense of wonder and play. I’d like to share three poems. The first poem is by Isla. She wrote it in English and I am helping her translate it into French. I love the feeling of this poem and its layers of images. I think it was mostly inspired by a poem I read by Marceline Desbordes-Valmore. She was writing in the early 1800’s, so she isn’t a Surrealist, but I wanted to share her work to show a) the dreamy imagery that was already a tradition in France, and b) how beautiful it was. Her poem is titled “The Roses of Saadi.” Isla’s is titled “Ange,” or angel. The third poem is by Cadence, and was written upside down. It feels like a direct descendent of the dark humor and wide-ranging images of the Surrealists. Anyways, it’s been a blast. I would recommend the anthology Modern Poets of France, translated by Louis Simpson if you want enough French Surrealism to turn you upside down. This entry was posted in Language, Poetry and tagged Education, France, Homeschooling, Language, literature, poetry, Seattle, Teaching, teaching English. Bookmark the permalink.